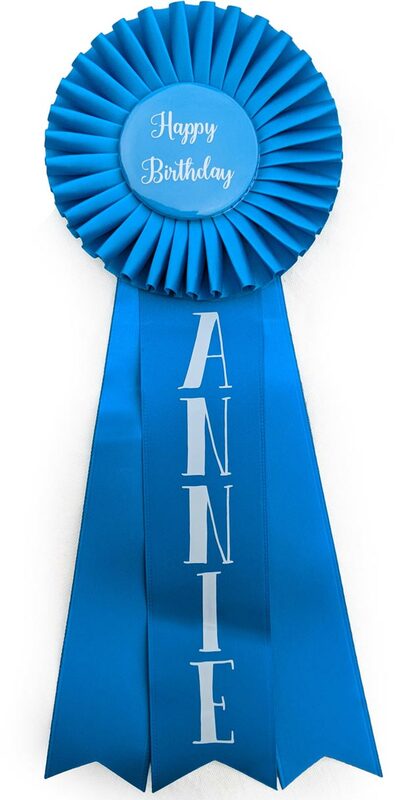 In this post, I’ll be showing you how to personalize a blank award ribbon rosette with a custom design, message, or personalization. 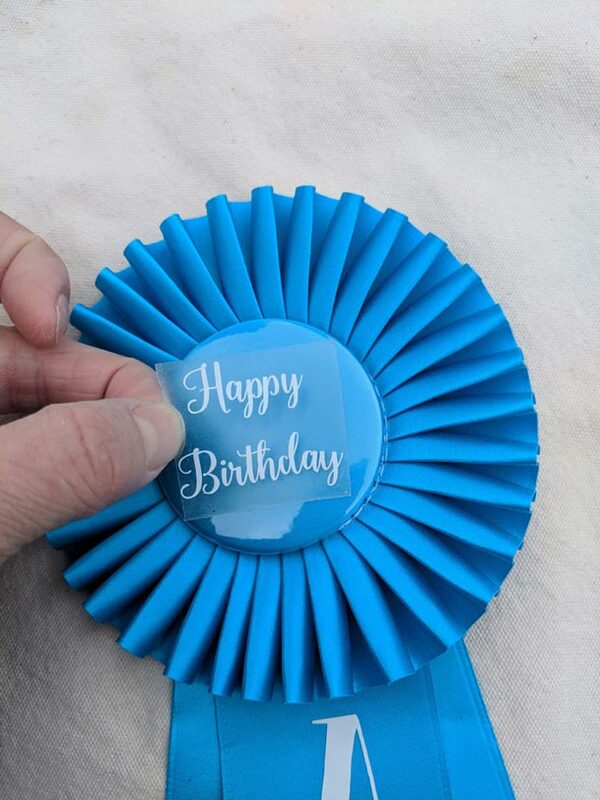 This method is perfect for creating custom gifts, awards, or to celebrate unique celebration that would be hard to celebrate or find a card for. 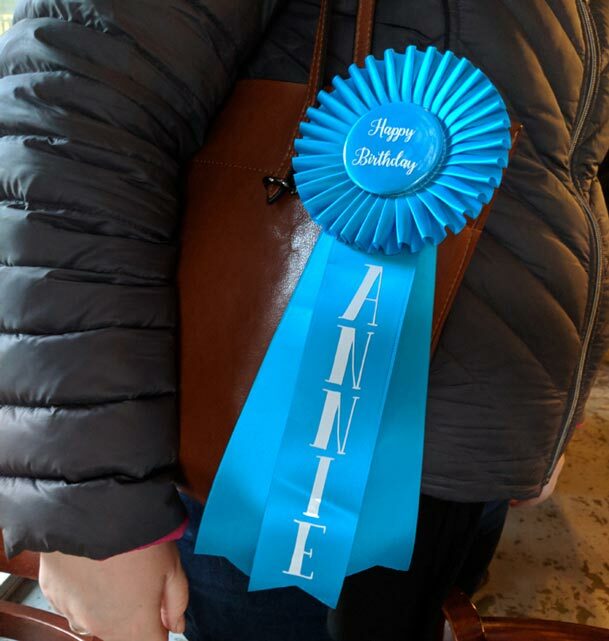 Using just about any vinyl cutting system such as a Silhouette or Cricut you can create a unique personalized gift – a ribbon rosette ribbon to celebrate events big and small, from the most ordinary to the most unique. 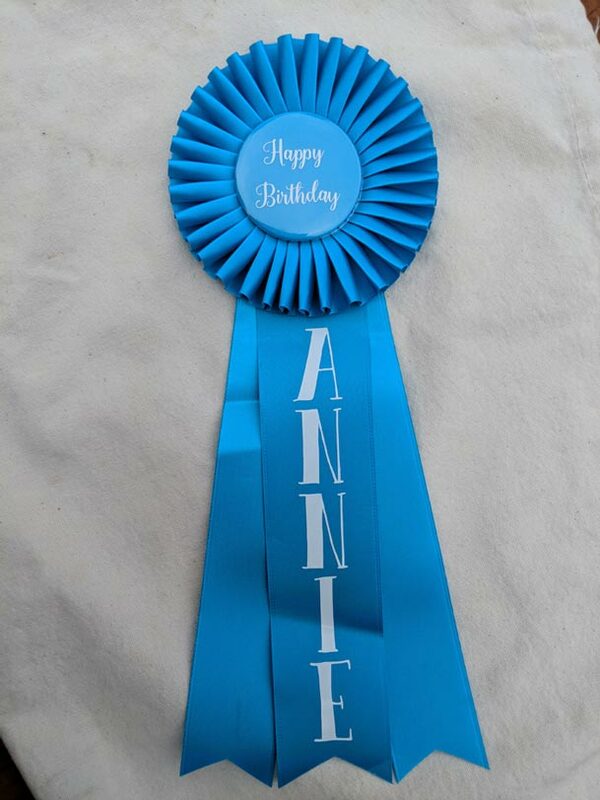 I’ll be adding a “happy birthday Annie” personalization to this blank ribbon, but you can use this same method for creating fun awards for your friends or community. These are perfect for when life circumstances call for a unique celebration – like an award for adulting or for getting a promotion, or even just working up the courage to do something ordinary but brave. 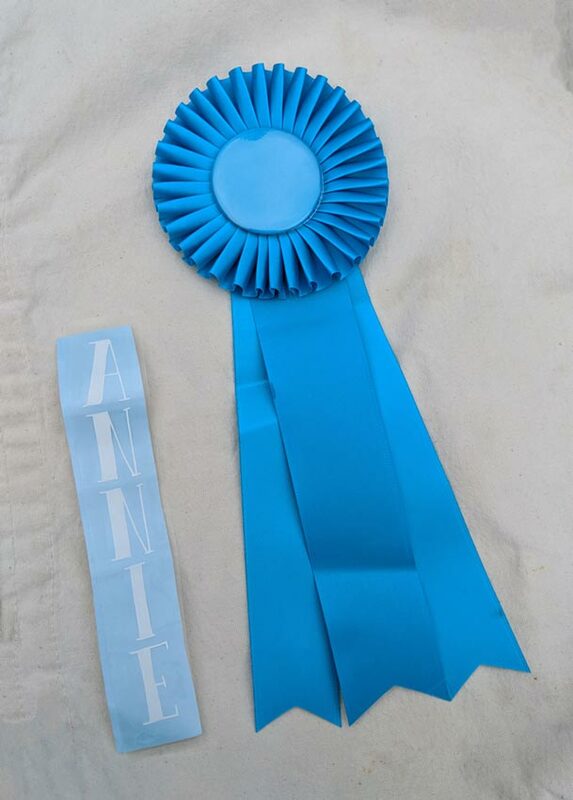 I love that combining the power of a cutting machine with these blank unprinted ribbons makes it a 5-minute project to create professional looking custom awards! Begin with your vinyl cutting machine. There are lots and lots of different machines and methods, so refer to your machine’s instructions. You can also hand cut the vinyl from vinyl sheets, but it’s pretty tedious. If you don’t have a cutting machine and aren’t interested in investing in one you may wish to find a friend or a business who could do the cutting for you. Etsy is a great source to find affordable precut or custom cut vinyl lettering. As long as it is long as it is vinyl and sticky it should work. 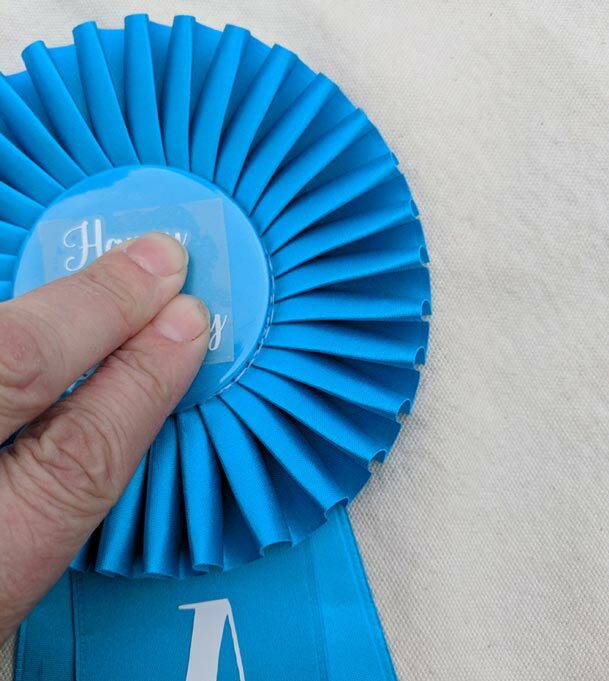 You can apply designs to the center of the award rosette, or down the center streamer- basically an endless number of combinations. 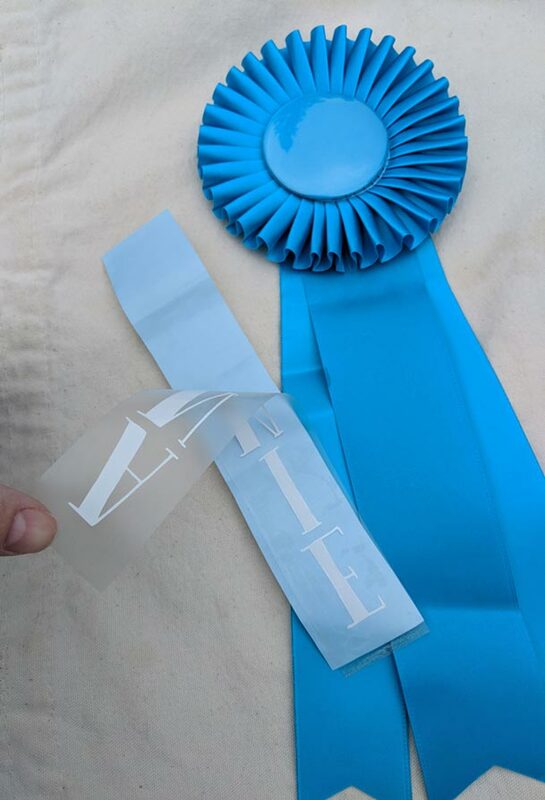 Begin by laying out your trimmed vinyl decal next to your ribbon. 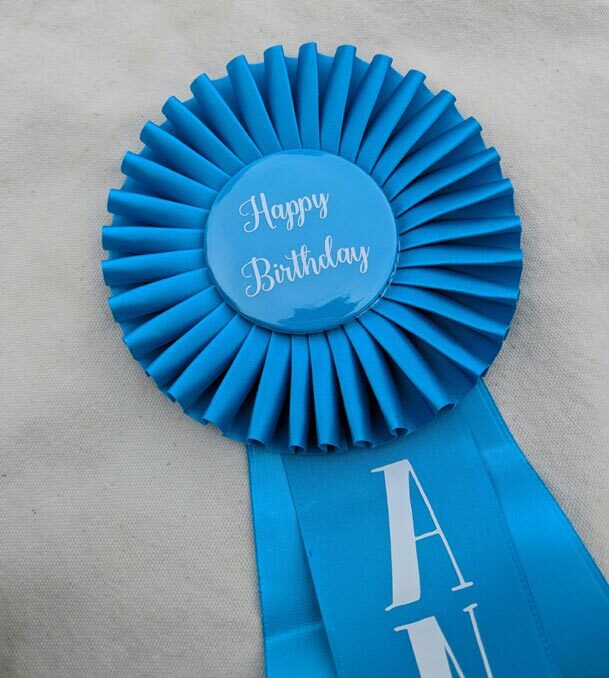 Check over your ribbon and if ironing is needed for a crease or rolled edge, iron the ribbon before vinyl is applied. Next, experiment with placement of the lettering. Confirm it fits and center the design. If needed, use a charcoal based fabric marking pen to draw grids to help you center the design when permanently placed in the next step. Once you’ve confirmed fit, remove the decal, turn over, and carefully peel the adhesive backing from the backside of the design. Now lay the decal down on the streamer. If you’re working with a design longer than about 4 inches, be extra careful when applying a decal to the streamer. 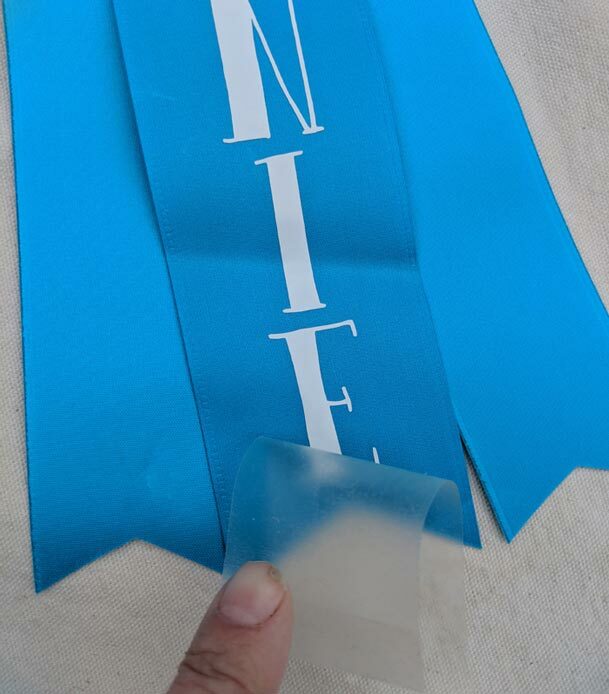 After you have peeled the backing from the adhesive letters, don’t flop the entire design onto the ribbon. Instead, start at one end, allow that end of the design to come in contact with the ribbon and then slowly slide your thumb down the length of the design, smoothing the strip of adhesive on to the ribbon. This avoids any wrinkles or misaligned lettering. 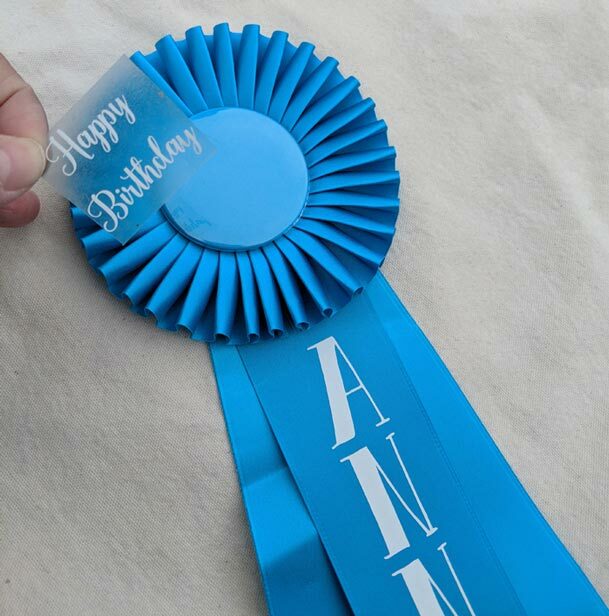 Once the design is placed on the ribbon, take a few minutes to smooth and press the design down onto the ribbon. 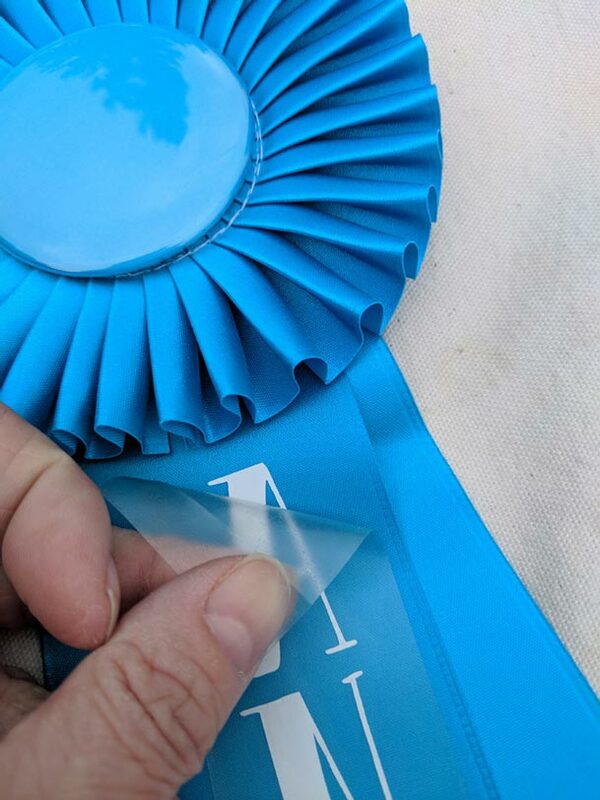 This satin ribbon works better than I ever expected for permanent letter adherence, but it’s still important to take a few minutes to make sure the adhesive and ribbon make contact. Smooth over the letters with the edge of an ID card for extra adhesion. Once well stuck down, begin at one corner lifting the clear film covering the design. Work at an angle, start from the top, and very gently peel it back. 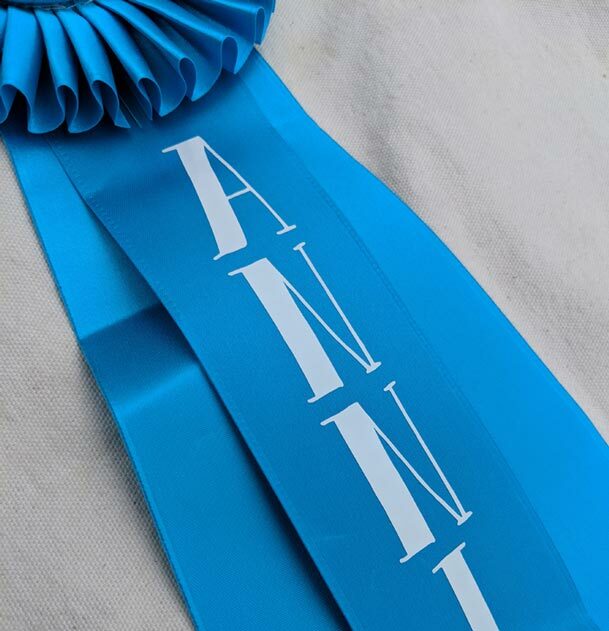 Make sure that each letter remains in place, and go slowly so that you are able to stop and restick any edges that start to lift from the ribbon. Applying the decal to the center button is done similarly to the process used to apply the decal to the ribbons streamers. Start by checking the alignment, then the backing on the adhesive, behind the letters, should be removed. After removal, place the design onto the button. 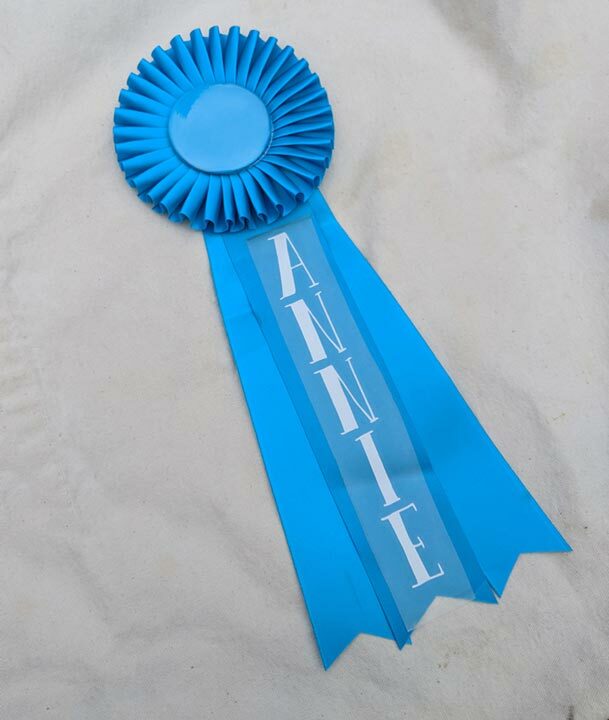 If you are using a new ribbon purchased from my rosette supplier you don’t need to do any surface prep. However, if you are using an alternate ribbon you may need to clean the surface first with alcohol and allow it to dry. Applying the decal to the center button is exceptionally easy, the plastic coating on the center button is the perfect surface for vinyl adhesive decals. 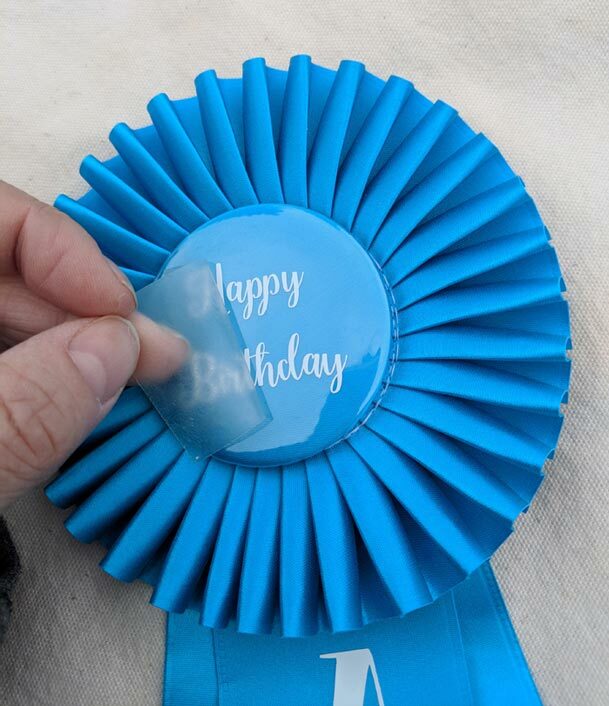 Simply press your design onto the rosette button and peel away the clear plastic cover, leaving your design behind on your newly customized ribbon. PRO TIP: You can use any lettering or design that fits within the round shape, but you will want to note that the center button is not perfectly flat – it’s a little bit convex. Make sure that your design accounts for a slight curvature of the surface. To avoid wrinkles I make sure that my design stays about one-third of an inch from the edge all the way around. Typically, to get personalized or even event specific ribbon requires placing a several hundred dollar order with a ribbon manufacturer. And even then, most award ribbon printers print only with gold embossing which looks cheap and dated. 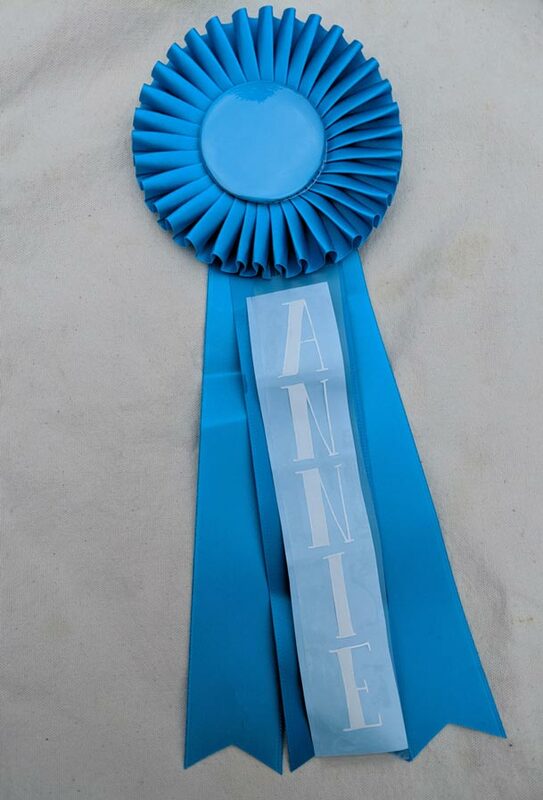 Using this method you can have award ribbons that are not only specific for your event, but also for a specific person. 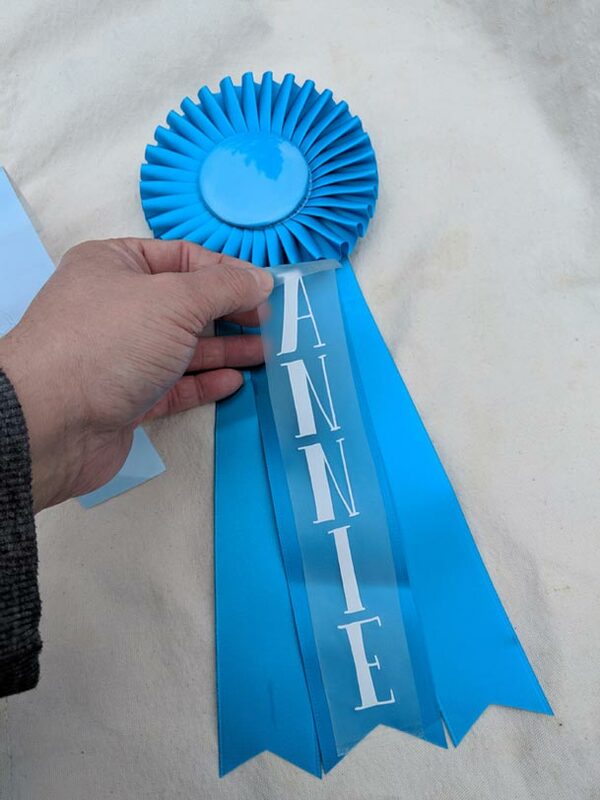 The cricut vinyl cutting machine also allows you to choose a more modern lettering style than just about any of the ribbon manufacturers are able to offer. The rosette style is typically associated with horse shows, but the flower-like rosette is a classic design that never goes out of style. This entire process is quick: My first ribbon took about five minutes to apply the decal to both button and streamer, but now that I’m well practiced, it only takes a minute or two for each ribbon. This makes it a perfect solution for small to medium-size events, contests, classrooms, weddings and bridal parties, etc.